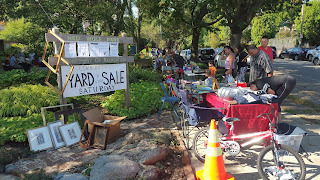 Friends of Ned Wolf Park: Yard Sale Success! 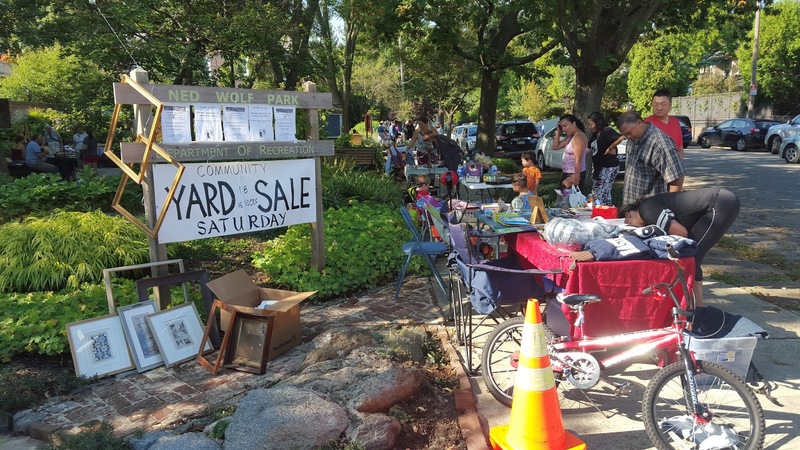 We could not have conjured more perfect weather for Ned Wolf Park's first Community Yard Sale on Saturday, September 16, 2017. The evening before, we swept the sophora and oak leaves off 27 vendor spaces marked with sidewalk chalk. Then, grateful for clear streets, we set out orange hazard cones to reserve the spaces for early morning unloading. And starting as early as 7 am, the Subarus and CRV's began to arrive with boxloads of items someone else needed to own. Folding tables were unfolded, merchandise was merchandised, and neighbors stayed neighborly as we prepared for a fun day together. Shoppers arrived in waves and seemed to enjoy both the sale and the shady gardens of this park known for its quiet beauty. Along with a cornucopia of used "stuff" of every vintage, an exquisite array of artisan baked goods were offered from a South Philadelphia wholesale baker called Machine Shop Boulangerie. Thriftiness met an urge to splurge at the corner of McCallum and W. Ellet Streets.